Let me begin by telling you that I saw this craft and I thought it was really cute----but, I had quite a time with it. I don't know if it was just me, if it was one of those things(even my pictures did not come out well), or if it really is difficult. I figured I would still share it with you though because; a) I said I would, b) it is cute, and c) I'm sure there are some great creators out there that can find a way to pull this off easier. Step 2 is to blow bubbles in the paint mixture. Make sure the child just blows, my little guy was blowing and then mistakenly sucked up the paint--eewww--he said it tasted like blueberry(maybe in his imagination!). When you have lots of bubbles you lay the paper on top of them to make an imprint on the paper--Good luck! Next take a carrot and cut it on a diagonal. 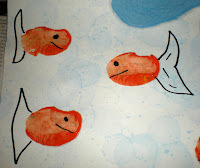 Dip the carrot into some orange paint and stamp some fish in the water. When the fish dry add some tails and faces--you can probably tell my fish weren't quite dry. The finished project is cute, but I think it was hard. Here were my main problems 1)was the paint mixture correct? 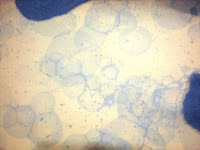 2) I had trouble keeping the bubbles from popping before I laid on the paper. 3) The paper didn't always mark, and it was hard to get the bubble imprints all over the paper--you can see I dropped it in the paint a few times. 4) I thought the bubble imprints would be darker. I guess I could have added more paint, but I did add quite a bit. The carrot making for the fish was easy and fun though. If you have ever tried anything like this, I would love to hear some secrets to making this easier and more successful. Thanks. I wonder how plastic bubble wrap (not sure if you call it something else) would go with this activity. 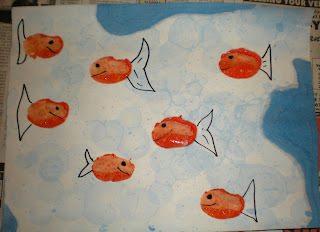 Just put paint on bubble side and print on paper then add the fish. 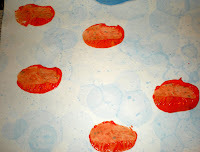 Or do the activity on blue paper and use bottle tops or the like dipped in white paint to make bubble prints? Sprinkle a bit of silver glitter on the circle prints for added effect? It looks great, I might give it a try with bubble wrap one day next week. Looks like you're still having fun creating things. Little Fun; Little Learning has been quite neglected lately. I have 4 blogs and have a hard time keeping up with them all. Thrifty Mommy and Keeping the Castle get most of my blogging time. I hope to post some more ideas this summer at Little Fun. Hope you enjoy your summer! I wonder if food coloring wood have help boost the color. I vaguely remember a fellow student teacher doing this lesson (bubble print) back in the day. I wonder if I still have her lesson plan. I'll look. I like Tania's ideas. We love glitter! May have to try that. I thought that you used thumb prints at first. Cute craft! Painting bubble wrap might have been easier and then stamping that to the paper. BUT really, it is very cute! I've used carrots before too. Oh it doesn't look like you had a difficult time! It turned out awesome! I used baby shampoo in our water table. Then we "made" the bubbles with egg beaters and plastic whisks. 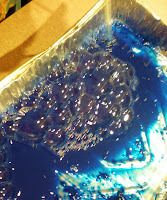 When the bubbles were done, we put some liquid watercolors on top of them. The colors were vibrant, no soap was swallowed, and the kids loved it! I know this blog post was from a while back but it came up on a search for swimming crafts. And luckily, I just prepared a bubble craft. I used individual plastic cups and covered most of the bottom with paint and then filled it up a little less than half way with bubble solution. I also cut a small hole in the side of the straw to avoid sucking up the soapy paint solution. It worked really well. I am definitely going to try your craft for a swimming theme story time and can't wait to use a carrot! I also thought they were thumb prints which I am sure would work too! Thanks for posting your creativity!